In music it’s a duet, but what what do you call this duo? Nowadays I rarely use other types of eyepiece. I added a 6mm Ethos last year and the pair of them have nudged the rest of my eyepiece collection out of use, a sure sign of their superiority for most applications. I’ve said it before; I’ll repeat it here: Ethos is just superb. But there is a problem. Now that I have more than one Ethos, how exactly am I supposed to refer to them? I have noticed a tendency to avoid using the word in writing because any way I spell it sounds wrong. Are they like sheep – identical in the plural, allowing me to refer to ‘a pair of Ethos’? Sounds odd, try again. How about ‘a pair of Ethoses’? Even worse. To get a better idea of how we might refer to TeleVue’s superb Ethos in the plural, we need to do some exploring in the inner space of language. The entry also marks the word ‘Gk’ which means that like lots of words in English - including Democracy, Strategy and Moron (Obama, Cameron take note) – the word ‘ethos’ originally comes from Classical Greek. Like many words derived from Greek, it has acquired a more highfaluting tone in English. The original Greek nouns - ἠθος or ἐθος -simply mean ‘custom, manner’, or of a man, his ‘disposition or character’2. ‘Ethoi’ might sound correct, but it isn’t. The problem is that there is another type of noun in Greek that end with ‘-os’ in the singular (the nominative singular to be exact) but that has a different ending in the plural; unfortunately ἠθος and ἐθος belong to that type3. I say unfortunately because what we end up with is a plural that is much less attractive in English, because the plural of this type of noun ends in a Greek letter - Eta - that we don’t have in our alphabet. So the plural of ethos in Greek is ἠθη. Transliterating into English, this would be Ethē with the ‘ē’ indicating a long sound like ‘Ethair’ or ‘Etheh’. 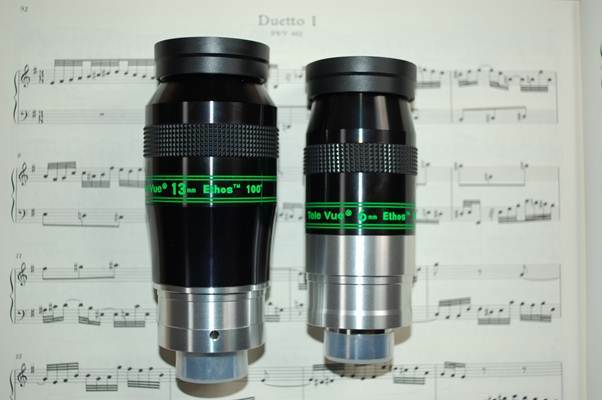 TeleVue have used another Greek word – the adjective ‘delos’ (Greek δελος) – for their new eyepiece line. It’s another apposite choice because ‘delos’ means ‘visible, evident, clear’ in Greek2. What’s more ‘delos’ (and I can almost hear you breathing a sigh of relief here) has a plural ending in ‘-oi’3. No, I don’t own any Deloi yet, but I’m sure I will eventually. 1 The Oxford English Dictionary (Second Edition 1989), Oxford University Press, Oxford. 2 An English Greek Lexicon, Liddell and Scott 1889, Oxford University Press, Oxford. 3 Reading Greek (Second Edition), J.A.C.T. 2007, Cambridge University Press, Cambridge.